Busy day ahead as Borussia Dortmund arrive in London ahead of tomorrow's Champions League game. The subject of conversation still this morning is the manager's interview with L’Equipe which took place two days after the Chelsea game and was published in the French newspaper on Saturday morning. You should probably read the English transcript of it before going any further. Needless to say, the newspapers have been going wild after the manager said he would consider his position at the end of the season if he believed he hadn't reached his own expectations. Post match on Saturday was the first time he was able to explain what he meant by that and he didn't go so far as to suggest that if he finished outside the top four in the league he'd automatically quit. "I wanted just to say that this is the club of my life. I have a contract that I will honour and the only way I would one day consider leaving is if I feel I have not done well enough for the club. "You cannot say you love the club and have a start like we had then ignore it. That is just what I wanted to say. "There is no mixed message in there. My commitment and love for this club is total. The only way I would consider my future is if I was not doing well enough for the club." Reassuring? Possibly. Wenger has never broken a contract with the club. He's never not qualified for the Champions League and the team are on a good run. So why cast doubts over your future when we appear to be in such a good position? Personally I believe the L’Equipe interview is more than Wenger opening his heart to a French newspaper. 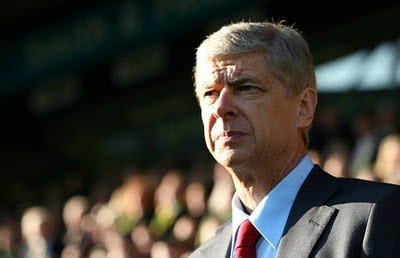 I think the manager is trying to strategically move behind the scenes to ensure that he gets the support he needs, possibly in the transfer market or with offering those players (van Persie, Walcott) who are coming to the end of their contracts the type of money they would expect to receive from a big club like Arsenal to stay. There appears to be a power struggle. We all know the manager desperately wanted to keep hold of Samir Nasri but was unable to match the wages Manchester City were offering. We heard in the summer Wenger speak about the two Manchester clubs, along with Chelsea, Real Madrid and Barcelona being in a different league when it came to playing their players than us. Now I think the struggle is on for Wenger to convince the Arsenal board it's time to increase our weekly pay ceiling. Arsenal's two largest shareholders are billionaires but neither is prepared to dip into their own pockets to ensure that Wenger can compete with the best. We all know that he's been able to achieve miracles on a shoestring but he's never had so much competition for his players than before. If he's not able to offer van Persie and Walcott parity of wages they'd receive elsewhere, why would they stay? Yes, van Persie has a genuine love for the club. But he will also be thinking about himself and he's got to be selfish as this will be the last big contract he will sign as a player. Does he stick with Arsenal or move on? He's got big questions to ask himself before the end of the season. I hope he does stay. We've seen this year what he can do when he's playing week in, week out. I'm sure we'd all like to see more of that in the years to come, but I guess that it will all come down to (a) money and (b) who offers him the best chance of winning silverware. The other area the manager will want backing in is in the transfer market. One of our major targets is Mario Goetze, the Borussia Dortmund player. Traditionally on the night before Champions League games the directors and senior officials from both clubs gather for a meal where they exchange gifts. Tonight will be no different as Peter Hill-Wood and Ivan Gazidis welcome the Germans to the Diamond Club at the Grove for a sumptuous meal. One of the topics on the agenda for Gazidis will be to pave the way for Arsenal to sign Goetze in the January transfer window. It's not going to be easy. The German club want a reported fee of £30m for their star player according to the Daily Mail. The Arsenal hierarchy will be turning on the charm and breaking open the expensive bottles of wine tonight in order to progress the deal. The manager will face the media later. It will be interesting to see what he's got to say on his relationship with the board. The other area I hope to find out about is whether he'll stick with the back four which started the game with Norwich at the weekend. As promised there were a couple of extra posts yesterday. For some extra reading have a look at Lewis Millen's Away Day post of his trip to Norwich. While Joss Bennett looks at Thomas Vermaelen's performance in the same game.